January | 2018 | Azazel's Bitz Box. 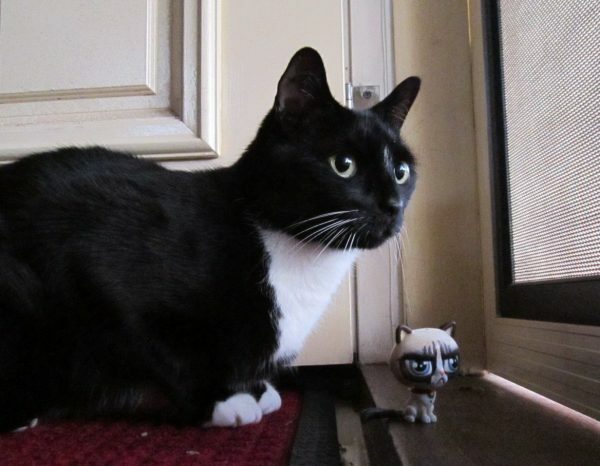 Leonard the Cat and LPS Bub look to the future of painting challenges. So as Painting Decembuary seems to have been reasonably successful for those of us participating, I’ve been asked about other challenges. I have an idea that I think manages to keep it simple but hopefully focused enough to keep it interesting for anyone who chooses to participate. February and March will be small challenges. I may or may not have an initial round-up post at the start of the month and a single wrap-up post for each of these two – but no more than that. This guy was REALLY neglected. For over a decade. February will be “Finish a neglected model” month. Simply complete a single model (or more if you want) that you started painting at least 6 months ago, but still sits unfinished. A game-legal unit of Minotaur Space Marine Devastators wot I finished. March will be “Finish a legal unit” month. I don’t care if or when you started the unit – or even how many models are in it. Just finish it. It could be 100 goblins or one Space Marine Medic. As long as it’s a legal unit for a game, then it counts. 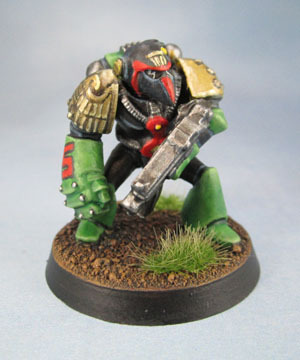 Example photo from mordian7th.blogspot.com (Mine are in a box in the shed!) Look at all those sprues! Euggggh! April will be “Assembly-Easter”. Where we celebrate not with chocolate eggs but by assembling something largish that you’ve been putting off for months or longer. I’m sure we’ve all got something like that. Depending on interest, I might do semi-regular updates as with Decembuary. 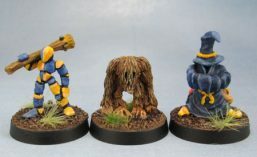 May and June will probably repeat the “neglected model” and “legal unit” challenges – simple and easily-achievable things that can nonetheless help to motivate us to get some more stuff finished – before another more “Main” Painting challenge in July. We’ll figure that out later, depending on interest – along with anything further through the year. 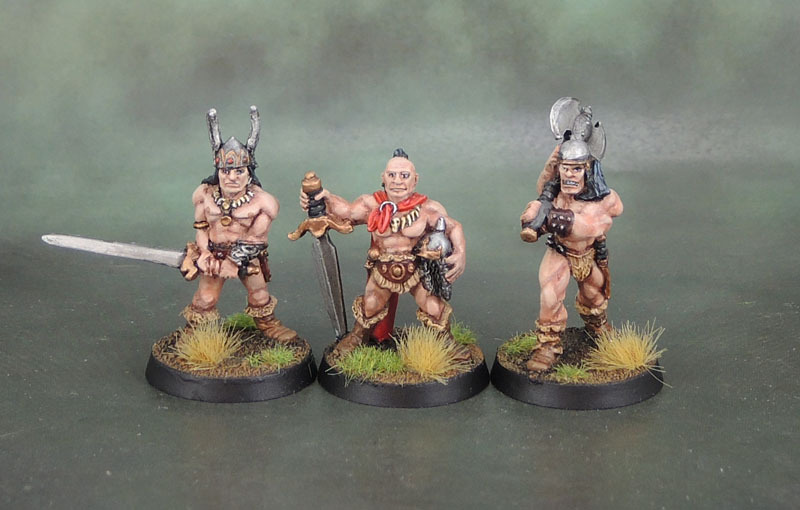 For a small donation of time this coming month, you can give your neglected models some paint and flock so they can find a new home on your shelf instead of thrown in a box. If Un-Neglect February strikes your fancy, then start thinking about what poor neglected model(s) you might have hanging around that you might be motivated to pull out of that cabinet, out of that figure case, out of that box, out of that sandwich bag – and get them finally finished off. The criteria for February: Simply complete a single model (or more if you want) that you started painting at least 6 months ago, but still sits unfinished. If you’d like to participate, please let me know in the comments here. Or don’t, if you prefer – but I can’t include you in round-ups if I don’t know you’re out there. I’ll do an intro post next week, then post your updates on your own blogs at your own pace. I’ll than do a wrap-up post at the end of next month. 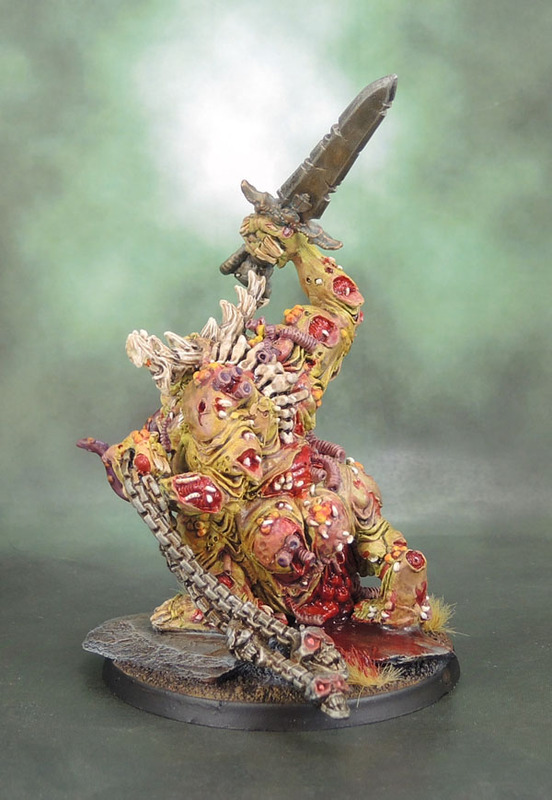 I’d originally planned to post up a WIP update on my Great Unclean One today, but… it’s not gonna happen. He’s currently outside with the 2-part epoxy I’m using to mount him to his base drying. He’s too heavy to trust superglue, you see. 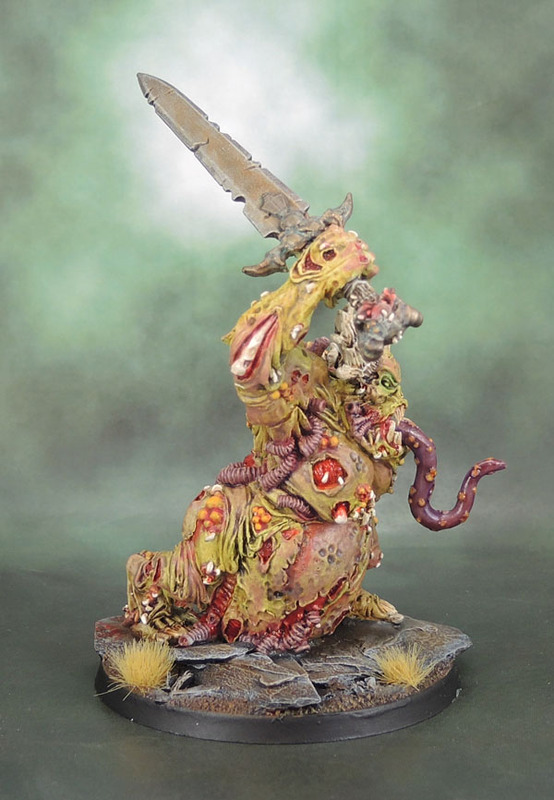 Instead, you get some more of my “warm-up” figures that I started on to get to grips with painting Nurgle Daemons. 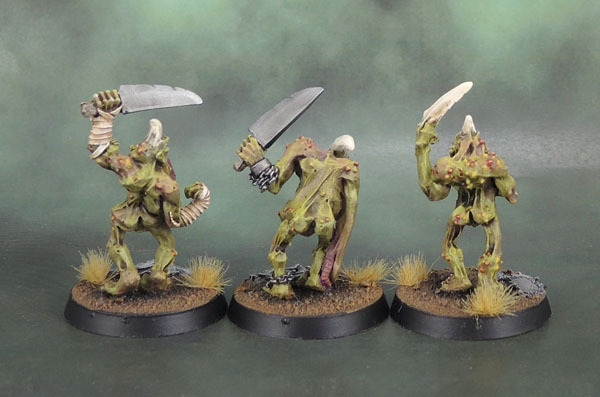 This second batch of Plaguebearers are from the third range of the Daemons. The second being an abominably bad range of models sculpted by Aly Morrison and/or Colin Dixon in 1995/96 (the old catalogues are contradictory across their volumes, but at least they credited their sculptors back then). 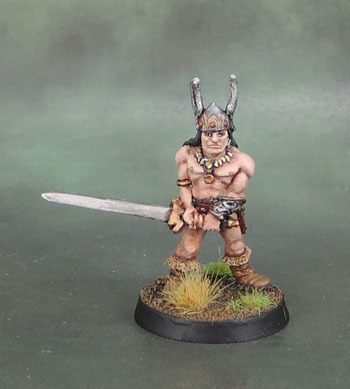 These models were released alongside the Warhammer Armies: Chaos Daemons and Codex: Daemons books, and are a big improvement over the previous range – though I still prefer the originals. 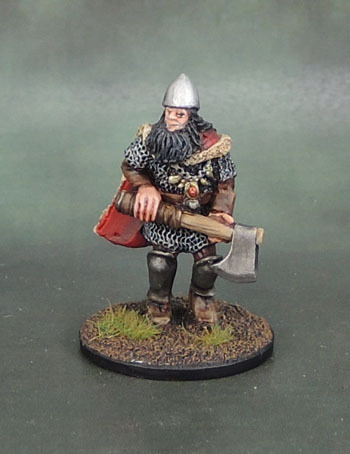 The only exception to that is the Musician/Bell Ringer, who was released in 2007 as one of the three command models to go with this range. 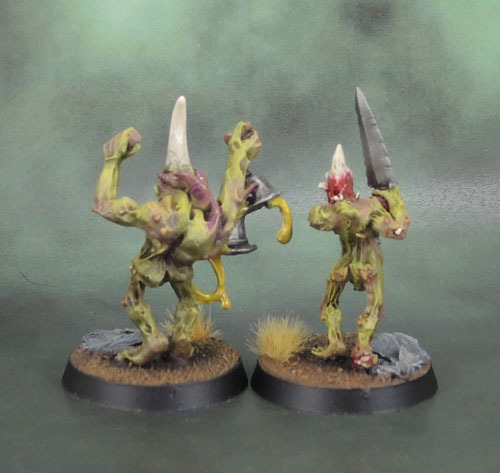 What this range of Plaguebearers did well was show the dour and uncomfortable side of Nurgle’s lesser daemons. With many of their limbs either mutating into maggot-tentacles or having them emerge from their bodies, the smiles and grins of Kev Adams’ range were gone, to be replaced by pained and twisted expressions. I didn’t like these models for the longest time, but now they have kinda grown on me. I honestly don’t even remember when or how I ended up with these. 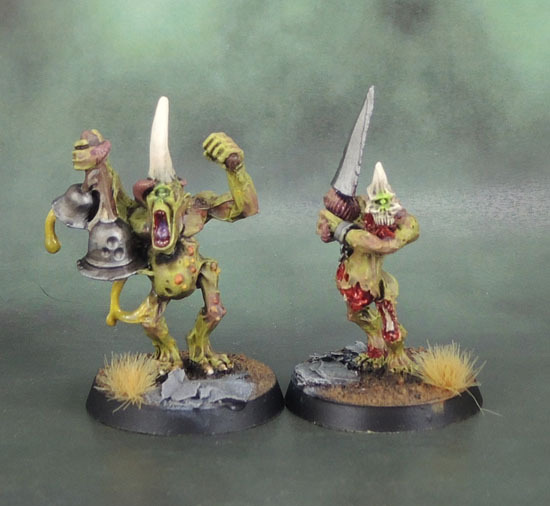 I must have found them in a (Nurgle) box a couple of years ago, then took the first 14 our to paint (these ones, plus the previous post) before they sat in limbo for ages. 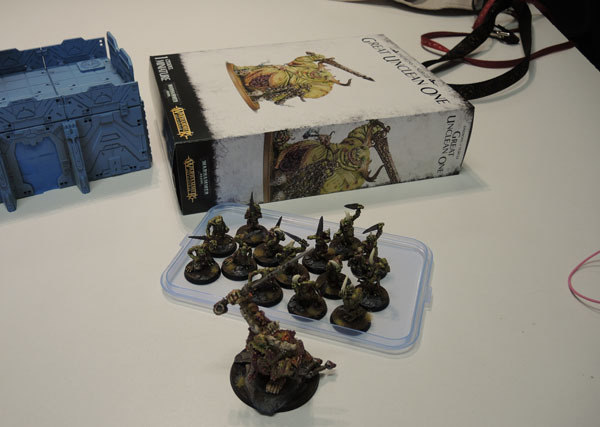 More recently, I opened up a (Nurgle) box while looking for the Great Unclean One that I’ve been painting for Decembuary and found a bunch more unpainted Plaguebearers from this range and the Dixon/Morrison range. It even turns out that I have all but one of the models in this range, the missing model being #2. 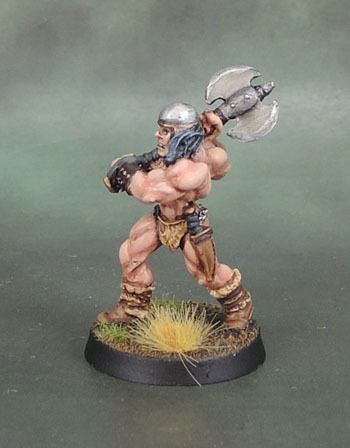 Model #1 is not painted in this shown batch. 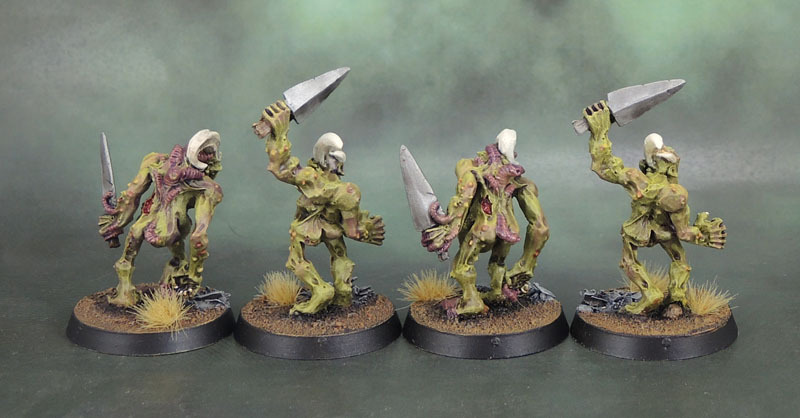 And so, yes, with the previous, original Plaguebearers painted up combined with the nine here, we have 14 Plaguebearers. Or two groups of 7. No surprises as to how that happened. After (re? 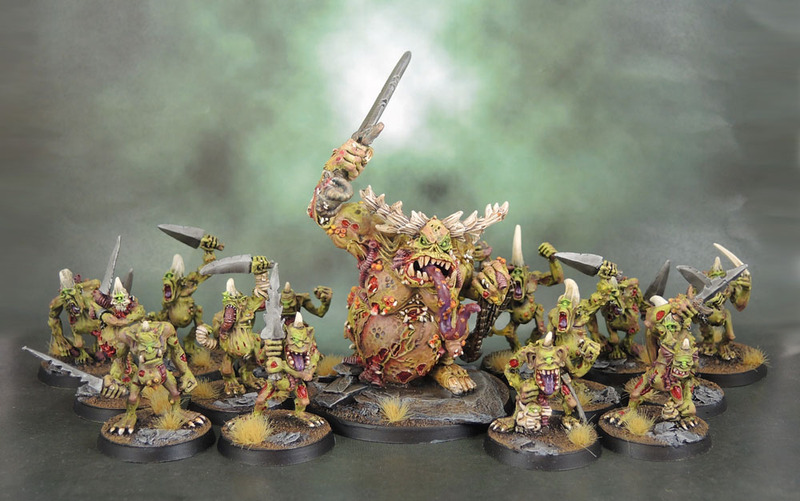 )basing them on 32mm bases, I sprayed all 14 of these Plaguebearers with a light green. At that point, they sat around, unloved for a VERY long time. 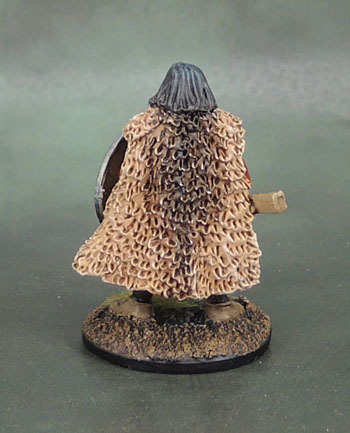 Recently, (as in a few months ago) I’ve looked up some tutorials and ended up giving them a wash of Athonian Camoshade as per Duncan (and others’) videos. 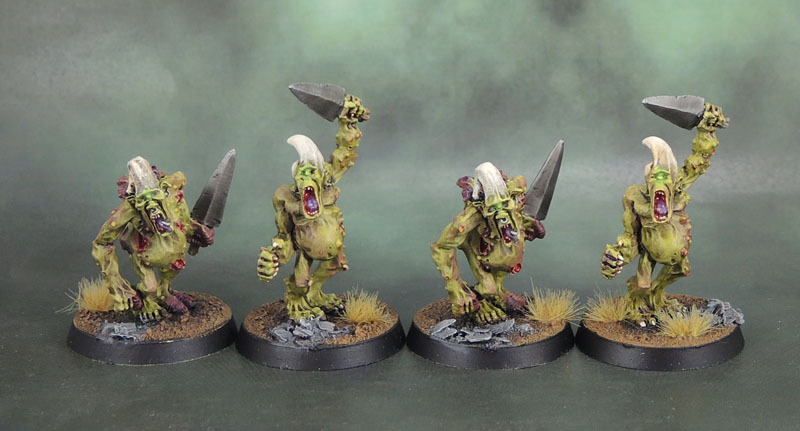 Unfortunately, they were going over white bases, not light green, and it gave these models an affect that I didn’t really like. They then sat for another long time. 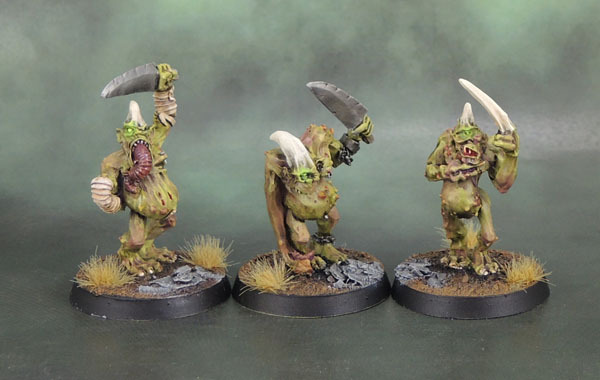 When I decided to paint the GUO and (hopefully) FW Daemon Prince, I decided to get these guys out again to use them as practice for the big boys. Experiments in varying their tones by using Bugman’s Glow skintone blended into their otherwise-green flesh on body parts like elbows, knees, knuckles and a little on shoulders and elsewhere seemed to work, and things like the purplish worms and tentacles also made their way across to the larger daemons. 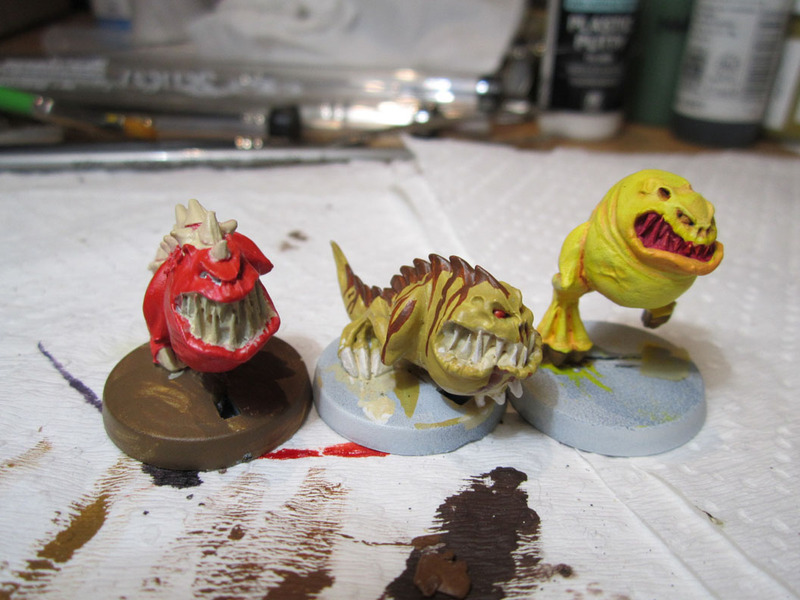 Of course, the next time I come to paint some Plaguebearers, I’ll vary the colour somewhat. That is to say I’ll batch paint another 7 or 10 or 14 of them in a new, consistent shade, and when they’re combined and mixed in with these 14, we’ll start to see variation between them within their units. I’m thinking perhaps a batch in light browns, and another in a pale off-white. Not counting the GUO, I have a little under 30 more metal Plaguebearers left to paint now. Then a pair of original Beasts and then Epidemius to paint to clear out my Nurgle leadpile. I’ve also got the Forge World GUO and a couple of other big boys, plus some Plague Toads and Blight Drones do to in resin. After that I can properly begin to get to grips with the newer plastic releases. 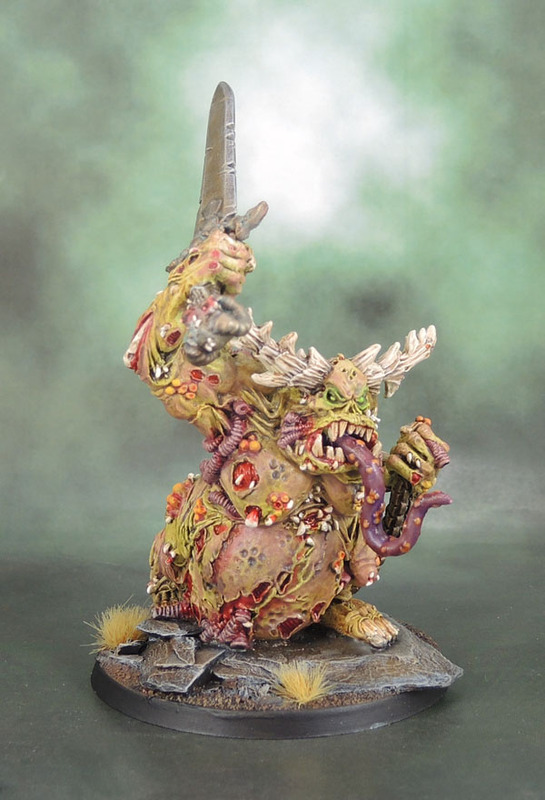 I’m not sure how far I’ll get through it all in 2018, but for the time being, I’m keen to smash through a whole lot of Nurgle. Wish me (and my attention span) luck! Today we have another update to the Decembuary project for this year. The amazing work just continues to flow here! 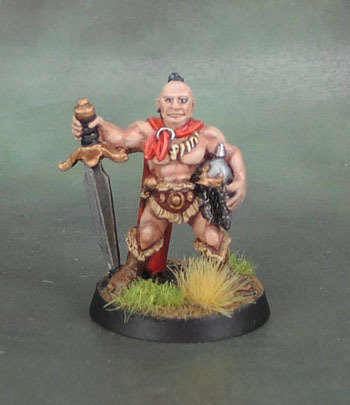 Imperial Rebel Ork aka IRO has completed his impressive project of a converted Ogre/Ogor/Mournfang Stonehorn. Who’s a hungry boy, then? I call the big one “Bitey”. 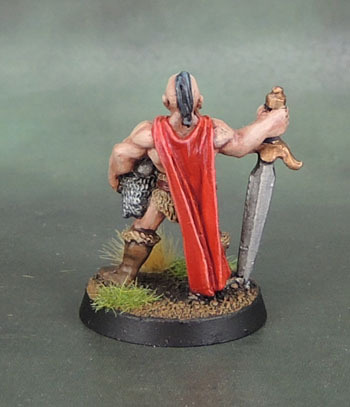 Alex from Leadbaloony has completed his custom Arkhan the Black. 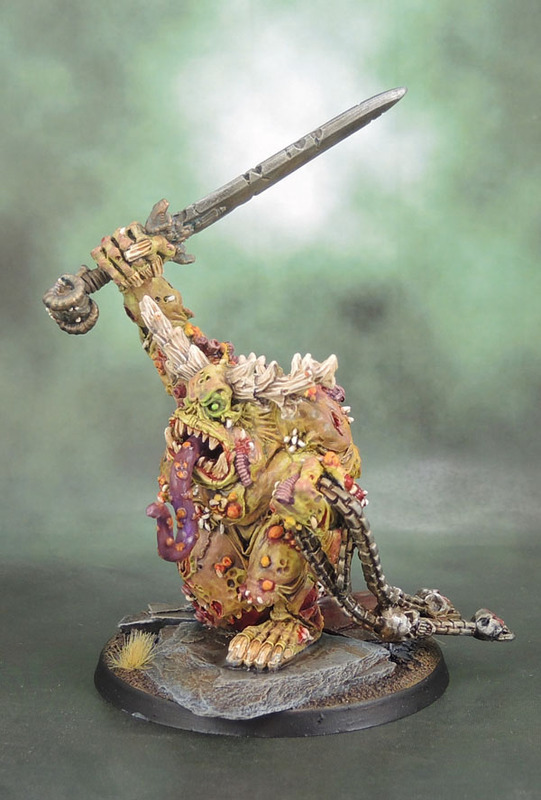 Amazing OSL on show here! Speaking of hungry, this one looks positively famished! 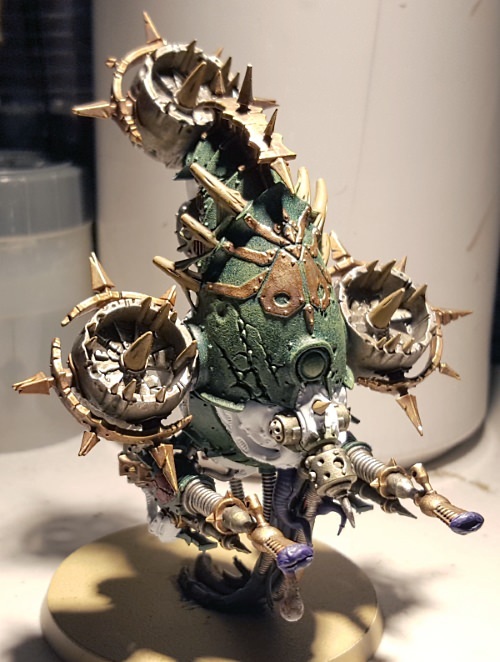 Ann from Ann’s Imperium has continued to work on her (in)famous Foetid Bloat-Drone “Becky the Bloater”. I’m loving that mottled green. Tinpotrevolutionary ‘s Iron Eagles Space Marine Dreadnought has started to have the details filled in. The Brass really pops against the grey. 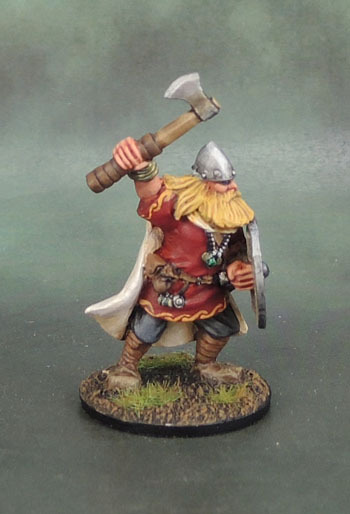 The 28th Scribe has updated on his progress with Grymdraig from Mierce Miniatures. The armour and skin are looking great here. Time for some space pyramids. And – oh yeah – me. 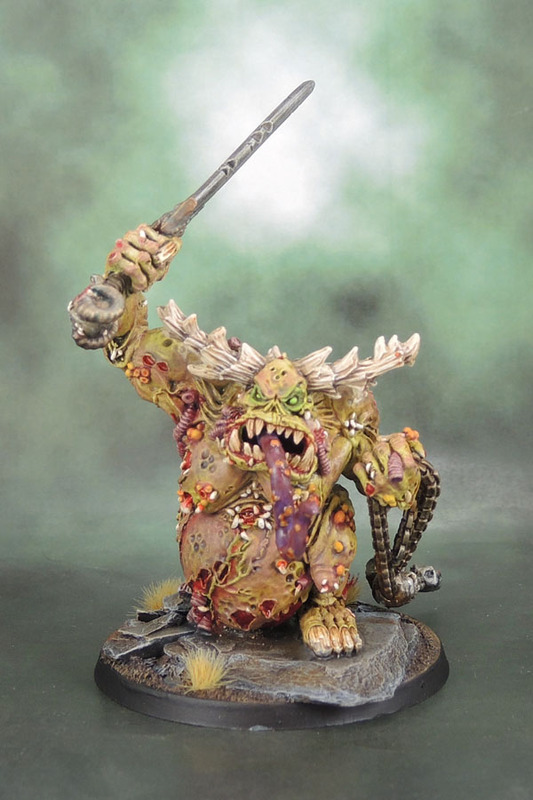 I’ve put the Forge World Daemon Prince to one side for the time being in order to concentrate on the metal Great Unclean One. I’ll put up an actual update post of my own in the next day or three, but here’s a current pic snapped a few minutes ago. 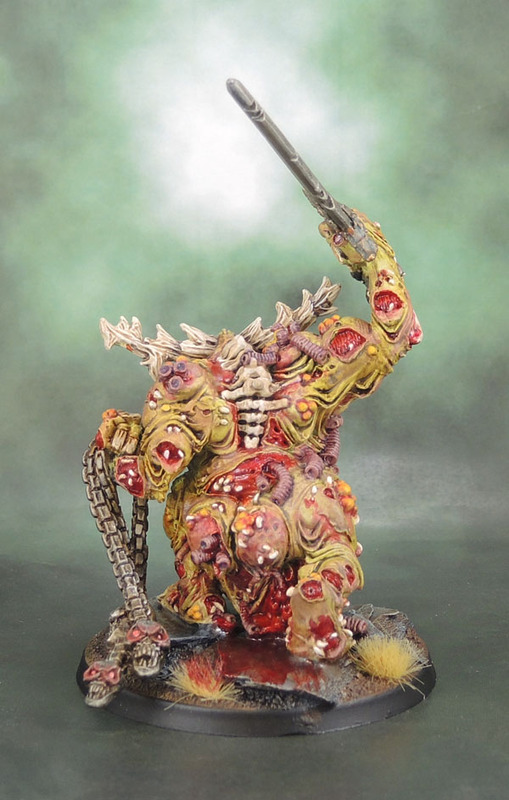 Thomas of High Times on the Eastern Fringe has been working on a Khorne Lord of Skulls. 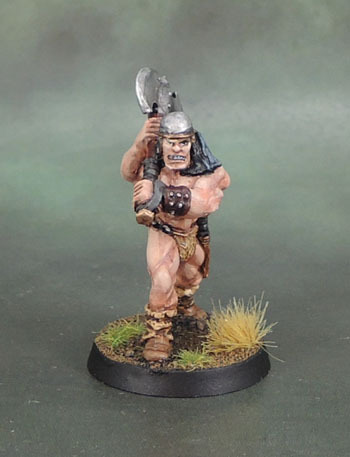 Wudugast from Convert or Die has been working on a Skaven Screaming Bell as a worthy cap to his Year of the Rat project. 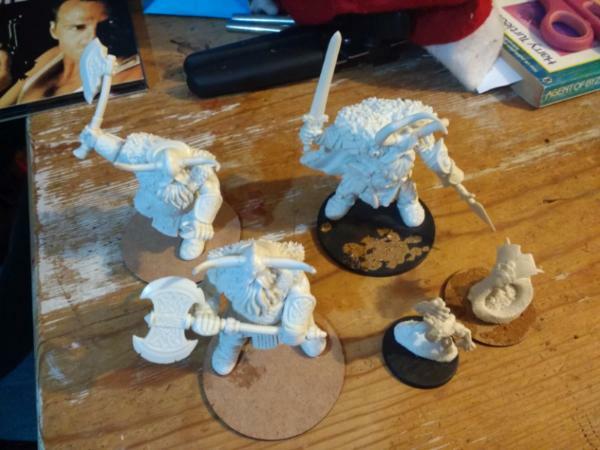 Ian Sturrock has started on a trio of Frost Giants from Bones III. 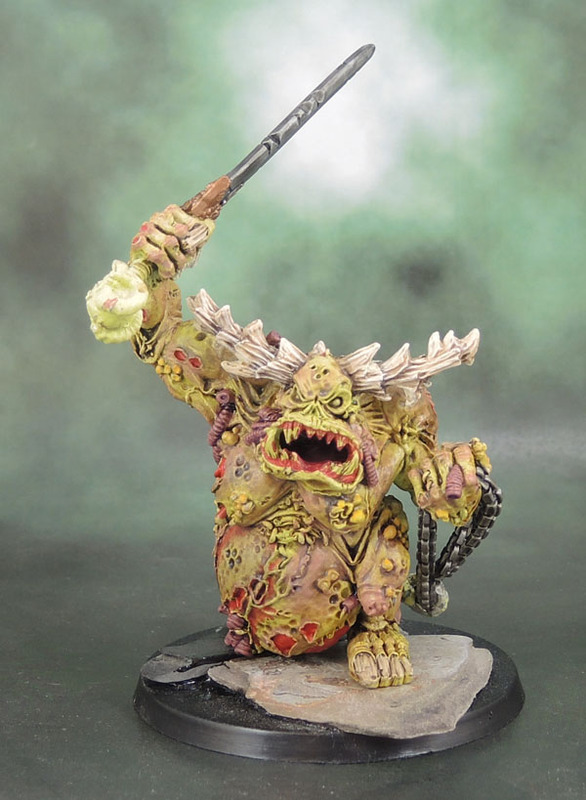 Over on Dakka, Joshinjapan did an inspirational job on Great Cthulhu from Reaper Bones. 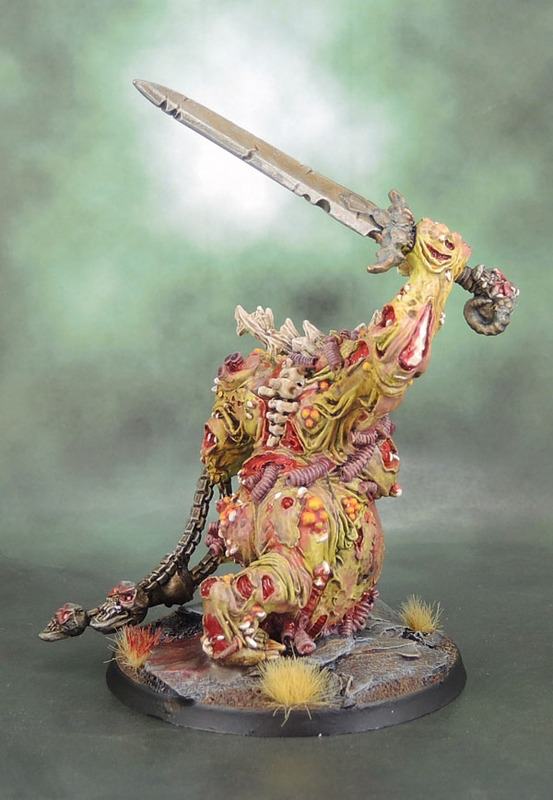 Zergsmasher smashed out Mortarion, who looks great. If all goes to plan, I’ll do another round-up next weekend followed by a final wrap-up late next week. 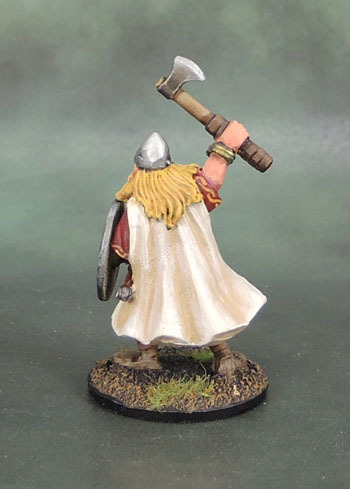 It’s been a while coming, but I’ve finally finished a few more of my Viking models. 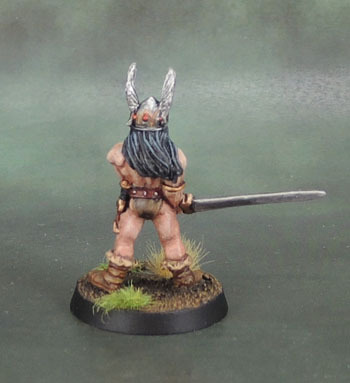 These three come from Wargames Foundry, specifcally from the VIK056 – Svavas Warrior Heroes set. The other three from this particular blister have all been allocated to other …duties. One a berserker, one a shieldmaiden and the other… a personality that will be shown later (once finished!) 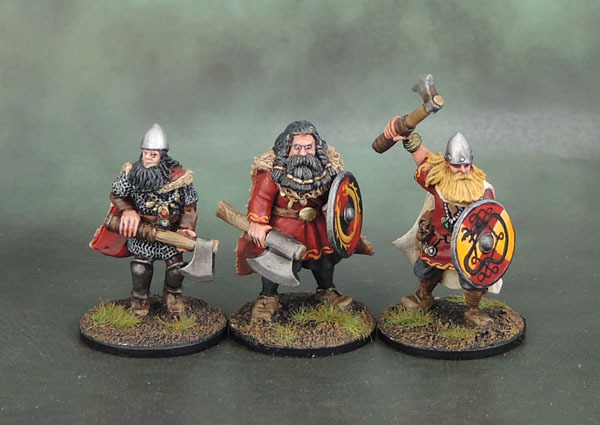 All three of these vikings are well dressed, so I see them as veterans who have amassed a certain degree of wealth over the years from raiding, bodyguarding, trading, or some combination of all three. As such, the palette features rich colours, some painted-on embroidered details, and their bling is painted in richer colours then Iron and Silver and I also wanted to emphasise their wealth with some nice shield designs. 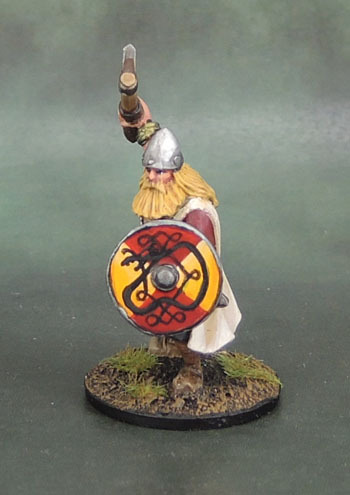 Especially since Foundry kept sending me plain shields whenever I ordered their vikings instead of the nice embossed ones they show on their site. 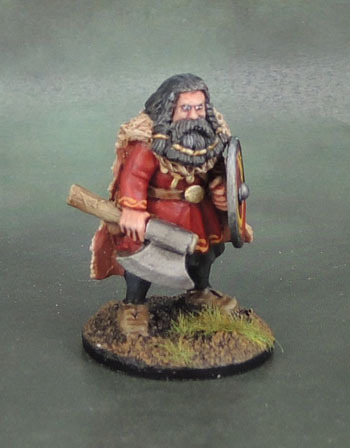 Bragi is my favourite of the three, with a bit of a Brian Blessed feel to him. Though less insane than Sir Blessed. His shield features a double-headed dragon (Double Dragon?) 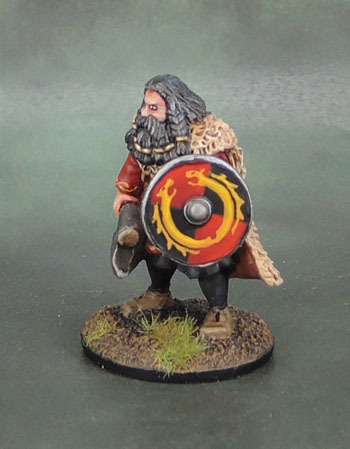 Across both Bragi and Dvalin, I decided to play with using the same three-colour palette and shield pattern (quartered) to create very different shields. Dvalin is really nothing special as a figure, but he’s got enough bling (the cape, really) to make him look a little important, so he also got a fancy shield design. In this case, a Norse knot-style serpent. Finally, Elbegast looks a bit dorky in my opinion. The bullet-head conical helmet combined with someone having stolen his moustache just makes him look a bit dorky to me. 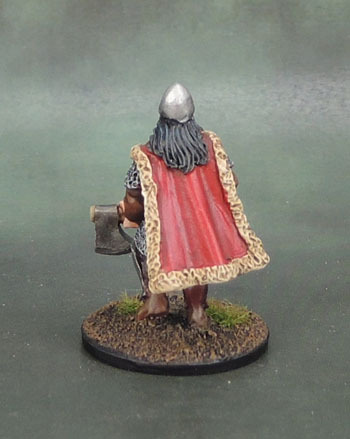 Still, his iron shinguards and fur-edged cape still indicate wealth to me, so here he is! Next post will (probably) be a Decembuary Update!